Here is my race recap from the recent J Concepts INS Race held at Hobby Action Raceway this past weekend. 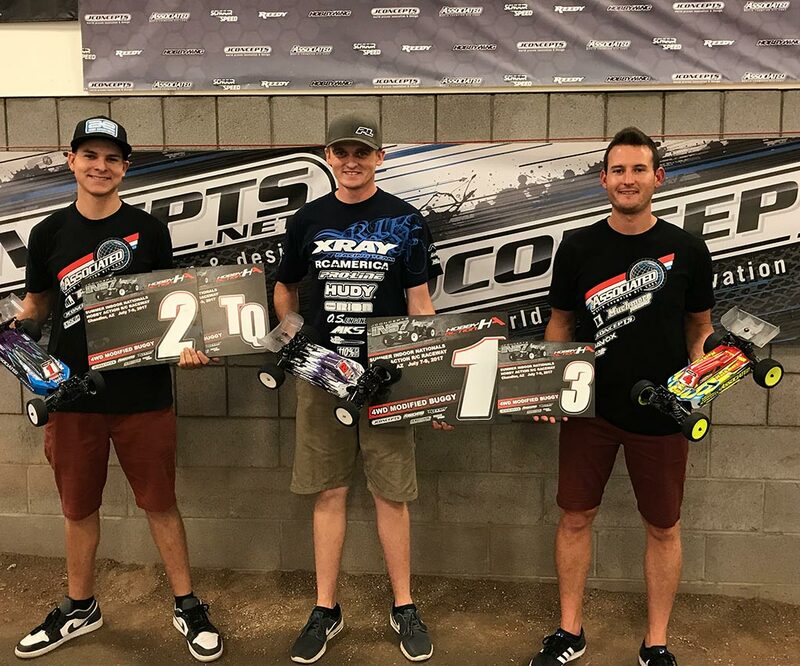 This past weekend I attended the J Concepts Indoor National Series race held at Hobby Action RC in Chandler, AZ. The temperatures outside were hovering around 115 degrees but inside with the air conditioning it was comfortable. We arrived at the track on Thursday for practice and the first impression was that the layout didn’t look very challenging, but when I ran on it the first time I was pleasantly suprised that it was much more challenging than I had thought and it was hard to get clean laps consistently for 5 minutes, which in my opinion was a good thing, I prefer to run on a challenging track rather than one that is too easy. The track was low bite all through practice until the seeding round when they blew the track off between each heat, keeping the track clean dramatically increased the grip level. 2wd was a bit of a struggle for us and I was only able to seed 5th, but the 4wd was working really well, was super easy to drive and fast, and I was able to top seed. In 2wd qualifying didn’t go so well, we were not able to get the 2wd to feel the way we wanted, we worked closesly with Cj and Tanner to get a solid setup but the steadily increasing grip would keep us on our toes, I was only able to qualify 7th. In 4wd , qualifying went much better, while it was still hard to go 5 minutes without making a mistake, I was able to qualify 2nd behind Spencer Rivkin. Sunday was main day with triple A Mains for both 2wd and 4wd. We started with 2wd A1, the track was watered overnight so it had a little less grip in the morning which made for an interesting main, there was a lot of crashing even at the front of the pack, after a couple of rough parts of the race I would end up getting 5th in A1. In A2 we chose to run slicks at the last minute, this was the first time we had run them all weekend and they changed the handling of the car alot, they were very fast but I had trouble getting used to them and made too many mistakes and only finished 9th in that main. For A3 I ran slicks again but we had made some changes to the car to make it easier to drive, I was able to make my way up through traffic to finish 4th which gave my 5th overall. In 4wd A1 was again ran in the morning so the track was low bite, there were a lot of mistakes made by everyone, I was battling for the lead a few times but in the end I finished 2nd behind Cavelieri. In A2 I ran slicks on the 4wd as well, my car was super fast on them and the 4wd adapted better to the slicks than the 2wd and I was able to take the win in A2. In A3 I got off to a good start and got into the lead after Spencer made a mistake and was able to pull away to an 8 second lead, at this point I’m not sure what happened whether my tires heated up too much, got too soft or were to worn but it caused my car to flip and be unpredictable, and within 2 laps I lost my 8 second lead and found myself battling for the lead from 3rd. 1st and 2nd got tangled with each other which allowed me to catch up and move into second, which is where I would finish, I tied points with Spencer but I won the tiebreaker giving me the win overall. Thanks to all my sponsors for making it possible to race and do what I love to do, Xray, RC America, Proline, OS, Hudy, Orion, MKS, VP Fuel, A Main Hobbies, Lunsford, Avid, Muchmore, Stick It 1, 110%, Darkside, Live RC, Red RC, Neobuggy. Thanks to my family for all their help and support, they have stood by from day one and have sacrificed a lot. Most importantly I want to thank my Lord and Saviour Jesus Christ, without him I would not be where I am today.